Bring a pot of water to a boil. In the meantime, snip the ends of your green beans, and wash them in cold water. Add them to the boiling water, and let them boil for about 1-2 mins, or until they are bright green & at your desired done-ness. I like mine very al dente so that they have a nice crunch to them. Set the beans aside. Bring your water back to a boil, and salt it (I used the same water, but you can switch it out if you want). Cook pasta as it describes on the box. When you have about 5 minutes left for your pasta to cook: In a large skillet (or a wok pan), melt the butter & add olive oil over medium-high heat. When the butter is melted, add the garlic. Let cook for about 30 seconds, while stirring, then add the green beans. Reduce heat to medium. Stir in the sun dried tomatoes. Add a little sea salt. When the pasta is finished, strain, and add to the pan (or add everything to a big bowl if you can't fit it all in the pan). 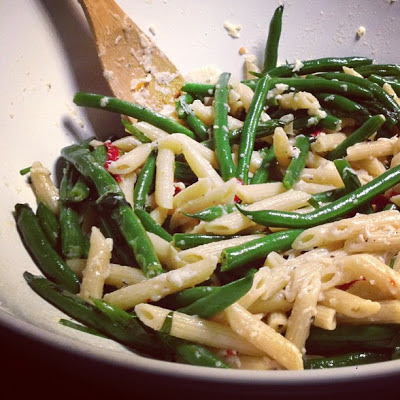 Mix in Pecorino Romano cheese, lemon juice and tarragon. Salt & pepper to taste. This was, seriously, one of my favorite dishes that I not only have made, but that I've eaten. The flavors worked perfectly, which could've gone either way since it was a complete experiment. I hope these directions do it justice. Enjoy! !